Amazon.com description: Product Description: This book addresses a major problem for todayâs large-scale networked systems: certification of the required stability and performance properties using analytical and computational models. On the basis of illustrative case studies, it demonstrates the applicability of theoretical methods to biological networks, vehicle fleets, and Internet congestion control. 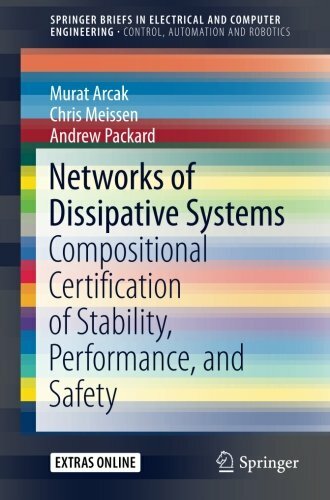 Rather than tackle the network as a whole âan approach that severely limits the ability of existing methods to cope with large numbers of physical componentsâ the book develops a compositional approach that derives network-level guarantees from key structural properties of the components and their interactions. The foundational tool in this approach is the established dissipativity theory, which is reviewed in the first chapter and supplemented with modern computational techniques. The book blends this theory with the authorsâ recent research efforts at a level that is accessible to graduate students and practising engineers familiar with only the most basic nonlinear systems concepts. Code associated with the numerical examples can be downloaded at extras.springer.com, allowing readers to reproduce the examples and become acquainted with the relevant software. About: This book addresses a major problem for today’s large-scale networked systems: certification of the required stability and performance properties using analytical and computational models.